If you’ve followed me for even just one week on Instagram stories, you know our family eats a LOT of avocados. They’re a part of nearly every meal! We go through about 12 Avocados from Mexico every week (I shop about twice per week and get six at a time). Some days, my two-year-old eats two all on her own, straight up with a spoon! Needless to say, I love avocados and am thrilled to be one of Avocados From Mexico’s recipe-developing ambassadors again. 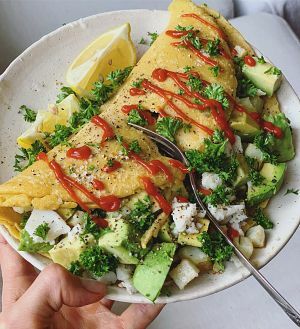 Behold, the first recipe in the series: Avocado Potato Breakfast Crepes. They’re so loaded, filling and healthy!! …the perfect, easy, super-nutritious breakfast that will keep you fuelled for hours. This is the sort of breakfast or brunch I love diving into after a long run. It’s hearty, yet guilt-free with all the healthy fats, yet zero cholesterol. Also, did you know avocados act as a ‘nutrient booster’ by helping your body absorb more fat-soluble nutrients from other foods you’ve eaten? Back to the recipe. The crepe is just two ingredients (if you skip the garlic, which you should do if you’re in a rush! …or use garlic powder). So simple. The only other prep involved is the simple chopping of a potato, and of course the avocado. Hope you agree this recipe is the perfect healthy breakfast idea! Tag me (@erinireland) if you try it — I love to see your plant-based dishes!!! Preheat oven to 400F and chop potato into small cubes. Transfer them to a baking sheet and toss with a splash of olive oil, the chopped rosemary and a pinch of salt. Bake for 15 minutes, until slightly golden. In the meantime, add chickpea flour to a medium sized bowl and slowly whisk in the water. Start with just a little so it doesn’t get clumpy. Add minced garlic, then mix some more. Heat a medium-sized pan over medium to medium high heat on the stove. Grease pan with olive oil (or vegan butter). Once it starts to sizzle (test by adding a drop of water to the pan) add half your chickpea batter to the pan (about ¾ cups) and cook until no liquid remains. No need to flip. Season with salt and pepper. Build your crepe! Feel free to build in the pan or after you’ve transferred the crepe to a plate (it is a bit delicate). 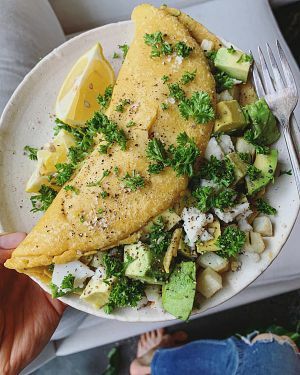 On one half of the crepe, add chopped Avocados From Mexico, roasted potatoes, squeeze of fresh lemon, parsley and vegan cheese (optional). Fold the empty side of the crepe over the loaded side and garnish with more parsley, salt, pepper and hot sauce, if you wish. Enjoy!!! 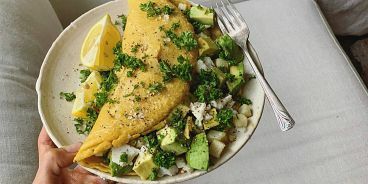 Read about the Avolifestyle and access hundreds of avocado-centric recipes, which are perfect for any meal of the day, by visiting avocadosfrommexico.ca (make sure to tag #avotime in any recipes you share).